"On leaving RADA I spent some time in ‘rep’ (most actors used to cut their stage teeth in these wonderful companies), then got married (to an ad. man who became a vicar), and, whoops, had seven children (not all at once) and they proved an effective end to a theatrical career. However, the ‘Costume’ thing blossomed (with all those kids I needed something ‘Me Me Me’ for sanity, darling) so I collected Old Clothes, including Old Knickers and Old Bras and became a passionate student of Costume History, a keen member of costume societies and, gradually, a respected Fashion Historian. "I’ve written several books, including ‘The Costume Collector’s Companion 1890-1990’ but it was the publication of ‘Knickers: An Intimate Appraisal’ in 1991, the first of an underwear trilogy (Bras and Stockings and Suspenders, plus others, arrived later) that led to my becoming nationally (heck, now internationally) famed as The Knicker Lady. It is all down to those smalls. "But, I admit, it has been hard on the Vicar." "Poor man, now he’s retired and only needs to button into his ancient cassock to take the occasional service – often, alas, a funeral (it’s his age) he has found, if not solace, new pleasure (well, the money’s better) in accompanying me on my various speaking engagements and stage performances. Because, believe it or not, a show biz career beckoned me once more and now I tread the boards all over the UK! Theatres up and down the land are full of people wanting to see my knickers." "And, darling, guess what? The Vicar is now my manager and roadie. He helps me clear up after a show. I tell him not to complain; not many ageing clerics get a chance to handle luminous thongs in Cleethorpes." Rosemary Hawthorne has been described as ‘The Joyce Grenfell of Knickers’ and as ‘…having the style and timing of pure comic genius’. Little wonder, therefore, both audiences and the media love her. Her books have been published throughout the world – from Russia to Brazil and her media credits include The Antiques Roadshow, The Victorians with Jeremy Paxman, The One Show and Woman’s Hour. 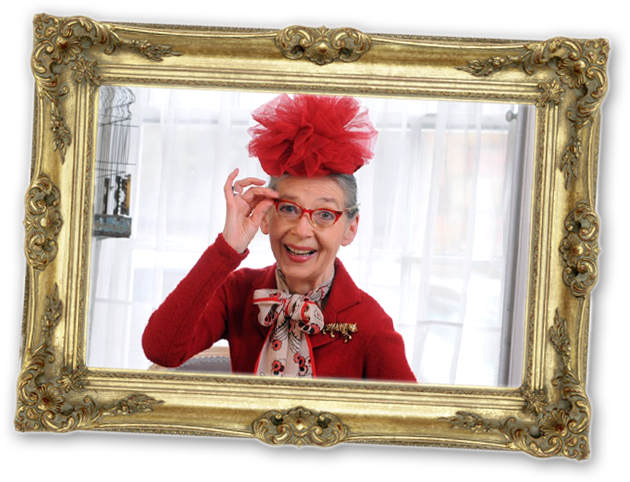 Rosemary is represented and managed through Vicarage Productions. "If you ‘phone about a booking you’ll usually get to speak to the Vicar. He’s like a dog, eager to please."